I hope you’re having a good week? I revisited one of my favourite cities last week. Prague honestly is the most beautiful location. Our holiday was made even more special by the company we had. They do say good friends can make any place fun, so I guess we were doubly lucky! These two restaurants were my personal favourites. They are both Italian and the food in each was amazing. Lascala is more of a pizza place and a bit cheaper, whereas Pasta Fresca had a wide variety of pasta and lasagna dishes. They both had an authentic, Italian, vintage feel and atmosphere. This place does an amazing sharing platter with some really interesting drink offerings. Warning: do Not get the Watermelon Rita, it may look fantastic, but certainly does not taste as good. The rest of the cocktails were lovely and I can’t put into words how much love I have for that food platter. Poor Ciaran really drew the short straw sharing with me! We went here quite frequently because of the atmosphere. The view wasn’t too bad either! The terrace itself is heated and at night time when the city is all lit up, it’s such an amazing sight. The rooftop is only open until about 11.30pm but there is a bar down stairs, it’s not quite as fun but has music and seems to always have a crowd. As I mentioned, once you have a good group, you can have fun anywhere. We went to Bowling Celnice on our last night. It was nice to do something different and the prices were really great. 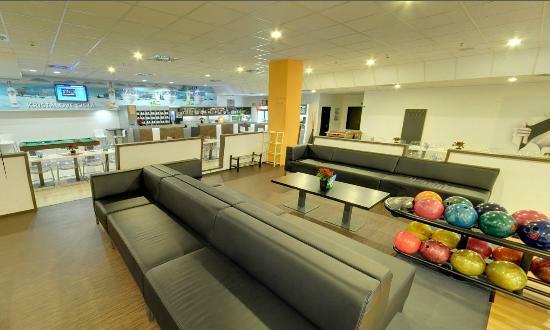 As with everywhere else in Prague, there is a bar in the bowling alley. Needless to say after one too many drinks, my already poor bowing got progressively worse. Being a little tired from the days and nights previous, we still had a great evening here. We did visit quite a few different places over our time here. As I was previously in Prague during the Summer, we had already seen the Charles Bridge and the Castle, both of which were amazing but definitely more of a Summer activity. If you’ve been to Prague before, be sure to let me know what you got up to. I think for us, it’s now time to plan our next adventure! This entry was posted in Fashion and tagged adventure, czech republic, Fashion Blog, inspiration, irish blogger, life, Lifestyle, motivation, photography, positivity, prague, Travel Guide by ZOELEXA. Bookmark the permalink.